I know I have been away from here for sometime now. The posts have not been regular since this year beginning. Its because I have lost ‘it’. ‘It’ being the writing style – the knack or whatever you call it. The thing that just clicks and falls in place, and the words would start flowing when you start to write something. ‘The thing’ doesn’t work anymore. Every time I open a New Post, I sit, I stare and then I stop. The much feared ‘Writers Block’ has paid me a visit! The motto of this blog being ‘Food and Talk’, and women in general favoring ‘talk’ over anything – even food, I feel I should do a much better job than what I am doing now. But then, the thing is to keep blogging and then keep your fingers crossed. One day, the words will start coming back. It has to. So, I am telling myself to chill a bit. With this Thayir Semiya, for now. Heat half a teaspoon of oil in a pan. Roast the vermicelli till it changes color. If you are using roasted vermicelli, skip this step. Add milk to the roasted vermicelli and bring to a boil, stirring now and then, to prevent burning. Once the milk boils, remove from heat and let it cool. If it is too thick, add some more milk. Once the milk is lukewarm, add the yogurt. Keep aside for 3-4 hours or until the milk sets as yogurt. Heat a teaspoon of oil in a kadai and add the mustard seeds and curry leaves. Once the mustard splutters, add raisins and cashews and fry till they turn into golden brown. Remove from heat. Add this to the set yogurt and vermicelli. 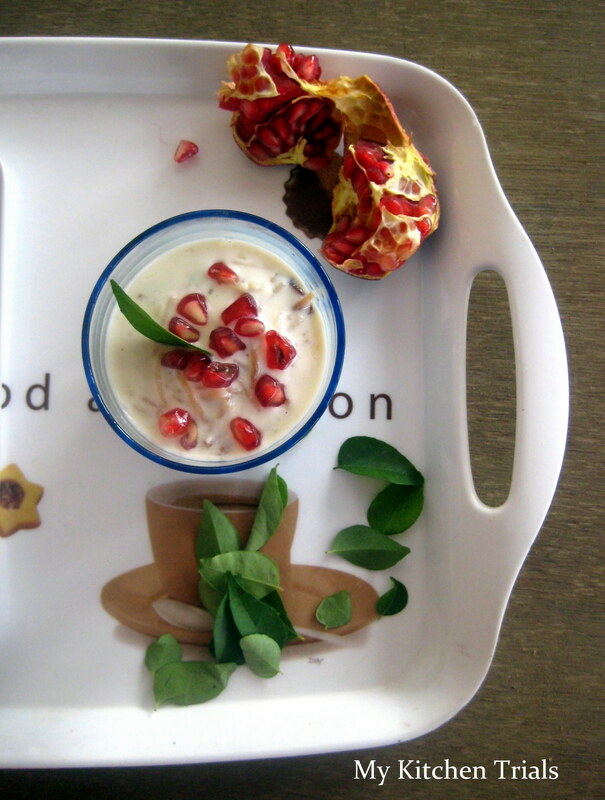 Add the pomegranate seeds and salt too. Give a stir, till everything is mixed, and refrigerate for an hour or more. 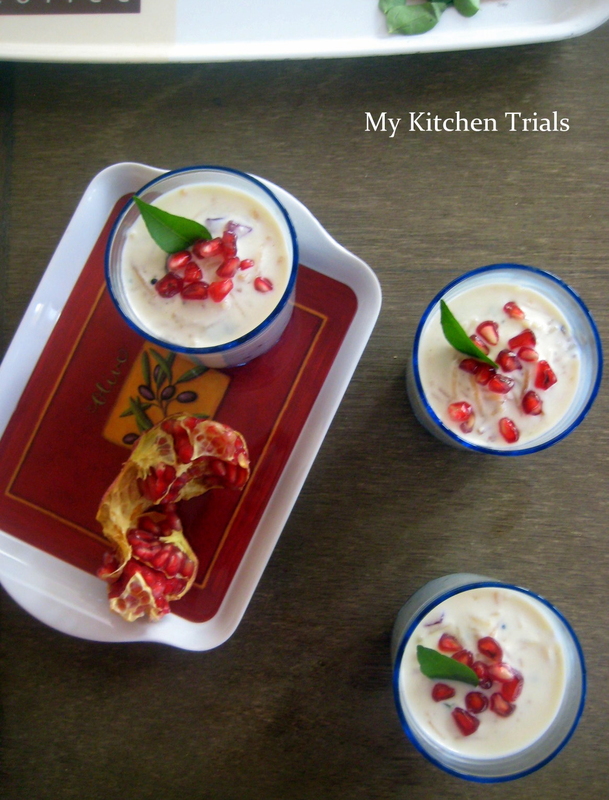 Serve in tall glasses, sprinkled with pomegranate seeds. This is again my cousin’s recipe. She is a repository of recipes, I tell you! The thing to keep in mind is that the yogurt shouldn’t become sour. Hence the quantity of yogurt, used for setting the milk, is high. If you are setting this overnight, then reduce the yogurt quantity accordingly and refrigerate before the yogurt turns sour. This dish has to be served cold and the tempering should not be skipped. The taste comes from the sweetness of raisins and pomegranate contrasting with the thick and smooth yogurt and vermicelli. I had it at a friend’s place and always wanted to try it. Thanks for the recipe. awesome..u made it perfectly……..vl try this…. 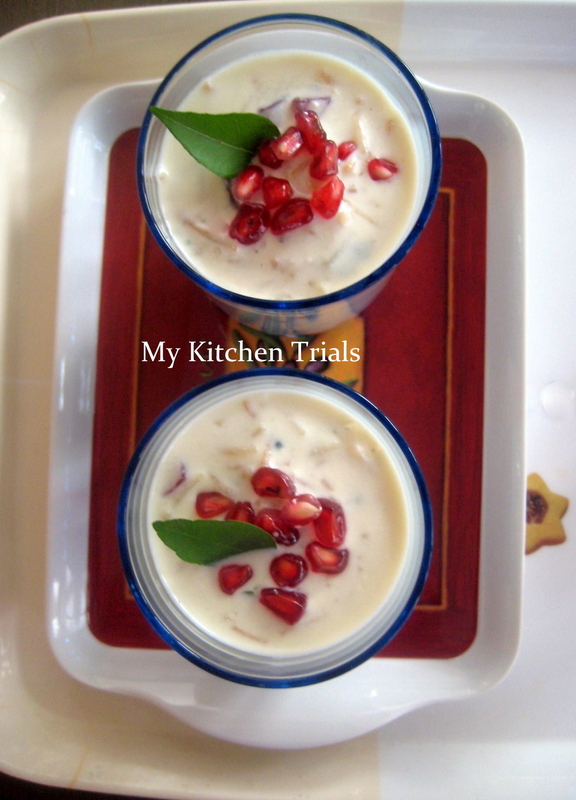 yummy recipe rajani.. thanks for the feedback about my dishes :-) i have eaten a similar recipe some time ago. One aunty served thayir semiya as a substitute for thayir sadam. Awesome recipe. Thanks for linking my event. My First Event – “COLOURFUL HOLI”.